Based on a recent study, the now only six month old iTunes Radio is the third most used music streaming service in the US. 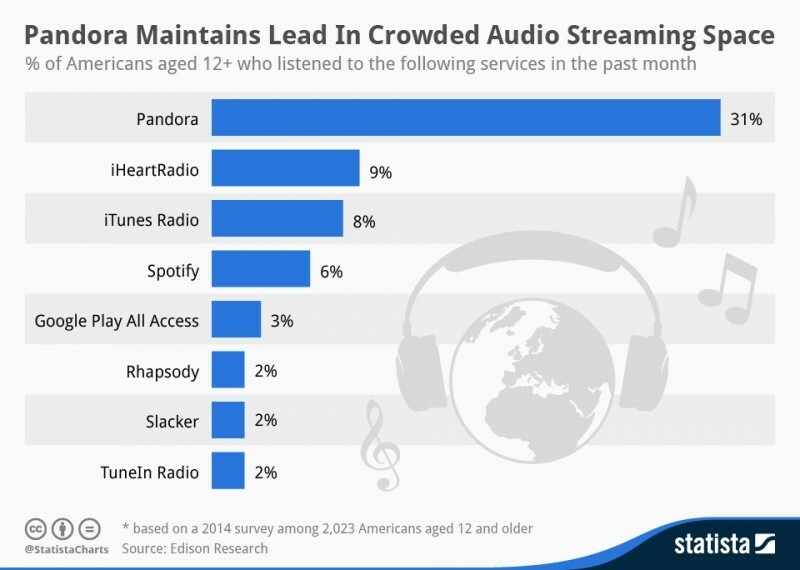 According to the Edison Research survey, iTunes is behind only Pandora and iHeartRadio at this point. The Edison study surveyed over 2000 people in the US the past two months and discovered that around 8% used iTunes Radio. Slightly above Spotify, which garnered a 6% share, iTunes Radio sits closely behind iHeartRadio at 9% and significantly back of clear industry leader Pandora with 31%, according to Statista's analysis of the survey. iTunes Radio launched last spring and quickly garnered a user base of 20 million in about a month. While Apple's streaming service has more than enough room to grow considering the 600 million users the company services through iTunes, Apple's radio service still has a long way to go before it reaches the 70 million users Pandora has captured since its official launch in 2005. Over the course of January and February, the survey took in responses from 2,023 people that were 12 years of age or older. That doesn't necessarily seem like a very large group and many people likely listen to more than one service at different times, so it is hard to say whether or not the numbers are as telling as they seem.